In his February 22nd letter to Koerner, Schiller wrote, " . . . These (last) twelve days, a revolution has taken place in my mind . . . I can not stay in Mannheim, any longer . . . People, circumstances, its surroundings and even the sky above me are disagreeable to me." "Beck, as Major, ueberraschte einigemal durch Groesse seines tragischen Spiels selbst den Verfasser. Demoiselle Baumann spielte die Luise Millerin ganz vortrefflich, und in den letzten Akten vorzueglich mit sehr viel Empfindung. Mad. Rennschueb spielte in der Rolle der Englaenderin manches vortrefflich, aber sie ist ihr nicht ganz g e w a c h s e n. Dennoch wuerde Mad. Rennschueb eine der besten Schauspielerinnen sein, wenn sie den Unterschied zwischen Affekt und Geschrei, Weinen und Heulen, Schluchzen und Ruehrung immer in acht nehmen wollte. Herr Beil erfuellte die launigte Rolle des Musikus, soviel er wenigstens davon auswendig wusste. Den Hofmarschall spielte Herr Rennschueb ganz vortrefflich. Auch Herr Poeschel gefiel in dem fuerstlichen Kammerdiener" (Goethe und seine Zeit 137). "Beck, as Major, several times, surprised even the author through the greatness of his tragic play. Demoiselle Baumann played Luise Millerin quite excellently, and particularly in the last acts with great feeling. Mad. Rennschueb played the role of the Englishwoman partially well, but she is not quite u p to this role. Inspite of this, Mad. Rennschueb could be one of the best actresses, were she only to remember the difference between affect and yelling, crying and howling, sobbing and sentiment at all times. Mr. Beil played the role of the musician, as far as he remembered his lines. Mr. Rennschueb played the Court Marshal quite well. Also Mr. Poeschel pleased in his performance of the Prince's servant. Schiller's journey and stay in Leipzig was mainly financed by Koerner's acquiring money in selling to the Leipzig publisher Goeschen Schiller's 'Rheinische Thalia' and by having Goeschen forward to Schiller an advance payment. It is now known as to whether Schwan replied to Schiller's asking him for the hand of his daughter Margarethe. In his summer residence at Gohlis, Schiller's companion was the Leipzig publisher Goeschen. Our background time table and background information to Schiller's development from his early childhood on, through his school years as an aspiring candidate for the clerical profession, his struggle at the Karlsschule and on his way to becoming a heroic poet (Thomas Carlyle's description of Schiller) ends here. 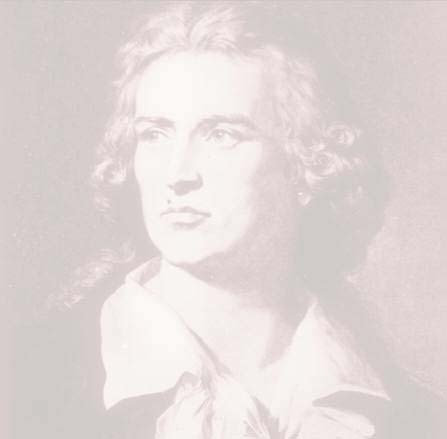 Without boring you with comments on the import of these details, we want you to be able to judge for yourself how much of all of these influences can be found in Schiller's original version of the 'Ode to Joy'. BACK TO THE TIME TABLE!